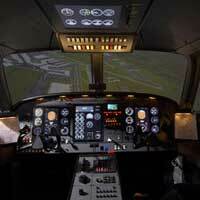 Take the control of professional flight simulator! King Air, Multi-Engines, etc. ! Location: St-Hubert airport in Longueuil. Duration: 80 minutes including 20 minutes of pre-training and 60 minutes of flight simulator. After a short class training on how the airplane flight simulator works and on the basic aviation principles, take the captain seat for a memorable flight. A professional flight instructor will assist you as needed. This airplane simulator is unique in Quebec. It allows to simulate standard and emergency procedures on many aircraft types in all weather conditions. The realism is stunning. A great experience and a memorable gift .